Our softgel drying trays are made by high quality food grade PE material, and they are with reasonable design and easy to stack up. 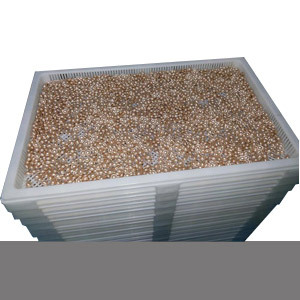 Besides, our drying trays own these advantages: good ventilation, good moisture removal and easy to clean, etc. Our trays have passed the examinations of the authoritative organization, and be in line with the requirements of FDA and 1935/2004/EC, (EU) NO.10/2011 regulations , so they can totally be used for holding food and health care products and so on.